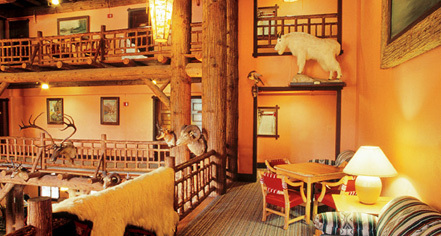 Lake McDonald Lodge was originally known as Lewis Glacier Hotel, the second hotel on the site, built in a Swiss Chalet style by John Lewis, a land speculator from Columbia Falls, Montana. Lewis had purchased 285 acres in 1904-5 and had the hotel built during a period when the Great Northern Railway was building other hotels and backcountry chalets. Opened in June 1914, The Lewis Hotel attracted nature enthusiasts including Charles M. Russell, who is claimed to have etched pictographs in the dining room's original fireplace hearth. In 1930, the hotel was purchased by the Great Northern Railway through its subsidiary, the Glacier Park Hotel Company and was renamed to Lake McDonald Lodge in 1957. Since then, Lake McDonald Lodge has experienced several renovation and restoration projects to highlight and enhance its architectural integrity that significantly contributes to the rustic charm of the destination. 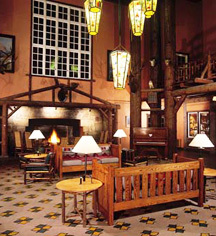 The main lodge was declared a National National Historic Landmark and listed on the National Register of Historic Places on May 28, 1987. For more information about Lake McDonald Lodge or to make reservations please visit glaciernationalparklodges.com/lodging or call 1.855.SEE.GLACIER (855.733.4522). Lake McDonald Lodge, a member of Historic Hotels of America since 2014, dates back to 1914.